Not only was Pa lucky enough to buy his dugout and a sowed field from a very clean, handsome Norwegian, Mr. Hanson, he works for another wonderful, good-looking Norwegian, Mr. Nelson. Pa retraces the history of their moves by recalling they lived with Swedes and Germans in Wisconsin, Indians in Kansas and now Norwegians in Minnesota. But he magnanimously admits, “They’re good neighbours.” Oh, wasn’t that kind of him? His next comment makes me wonder what he really thought about my people. He says to Ma, ”But I guess our kind of folks is pretty scarce.” (p. 44) What did he mean by OUR kind of people? Apparently, Caroline is Scottish, but with Dutch nobility. Charles had a grandmother from the famed Delano family, but I never heard of them until I read Wikipedia, and traced English family back to the Mayflower. Oh, they were those kind of people. But, how kind of them to consent to living with Norwegians.Oh, wait, is that why Laura insisted on the old English spellings in her books instead of the new American spellings published by Webster in 1828? 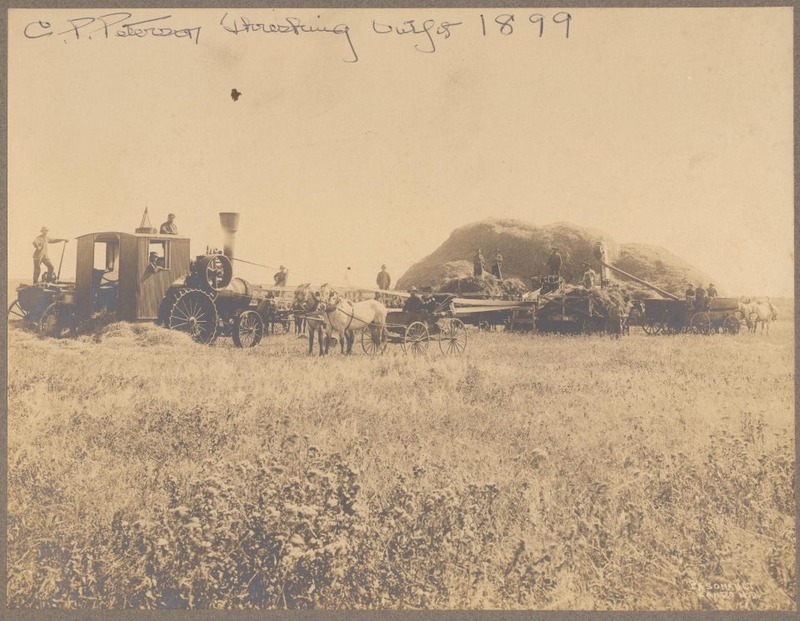 It’s now harvest time, 1874, and Pa can’t start his field until he’s cut Mr. Nelson’s wheat. He cuts it by hand with a scythe, binds it in bundles and stacks it to dry in the sunshine. Over and over he swung the blade, cut the wheat, tied it up and stacked it. He worked so hard, he was too tired to fiddle. For Pa, that’s tired. If you watch this video of a teenage girl using a scythe, you’ll wonder why Pa was so tired. After all, he was a pretty strong pioneer man. Anyhoo, when Pa is done cutting, three men come with a threshing-machine. For a little girl who loves adventure, I can’t believe Laura only described this amazing occasion only by saying she heard “harsh machinery noises” and “when the sun rose chaff flew golden in the wind.” (p. 53.) Wanna’ hear those noises? 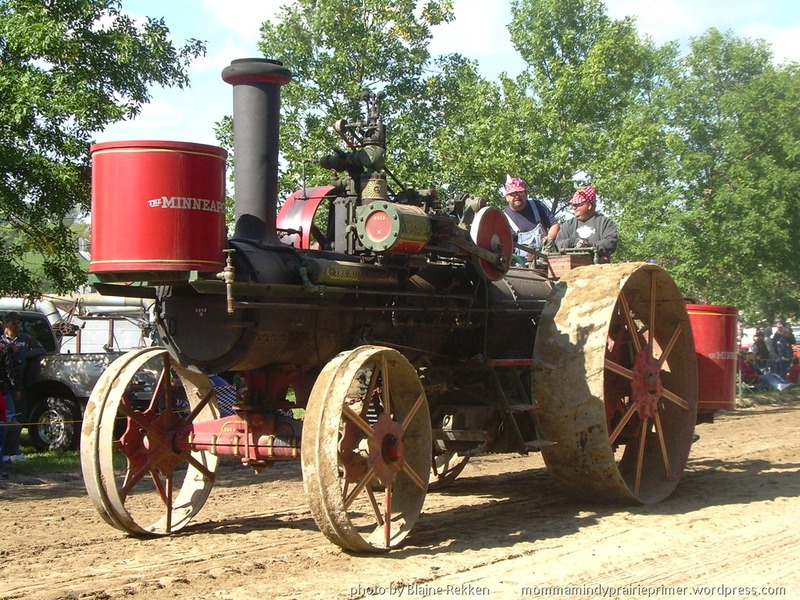 Watch this video from an 1870 thresher. It only had two owners and is now a museum piece. But, that’s it? That’s all she has to say? He Pa cuts the fields by hand and instead of thumping on the stalks of wheat by hand to separate the kernels of grain, he has a high tech piece of equipment that saves him days of work. She wasn’t impressed, but I was. I love farming. I dug ya’ up some history and some family pics. Here’s a pic from my cousin Dean’s family, also of good Norwegian blood. His mom came from the Peterson family who homesteaded near Bisbee, ND. 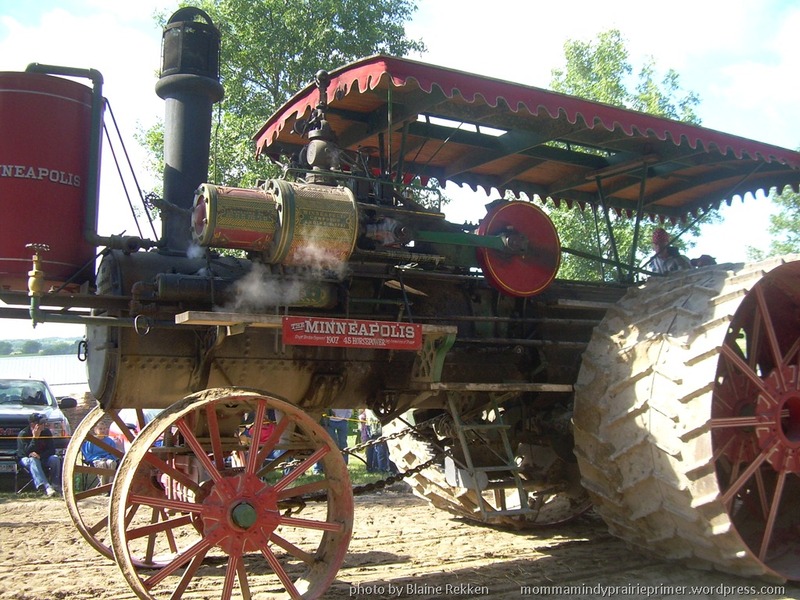 You wanna see how these old steam threshers work? 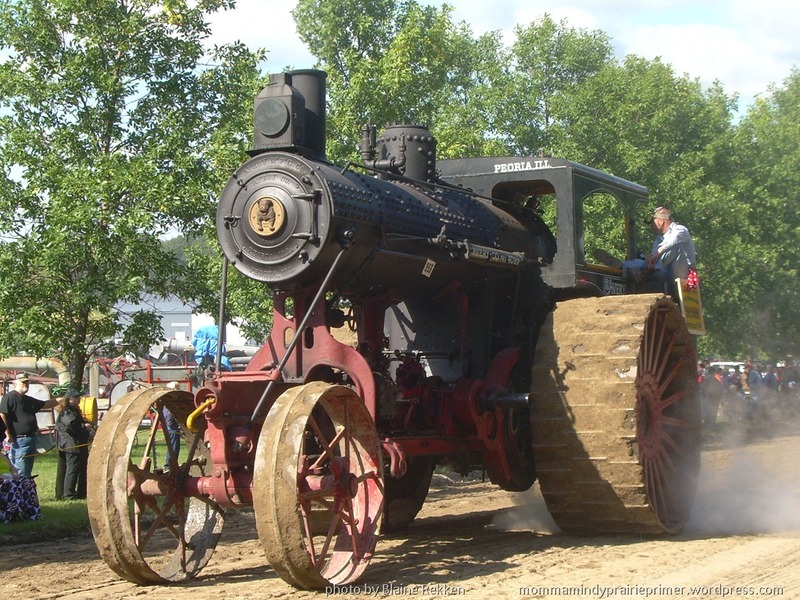 Western MN Steam Threshers has their own YouTube channel. 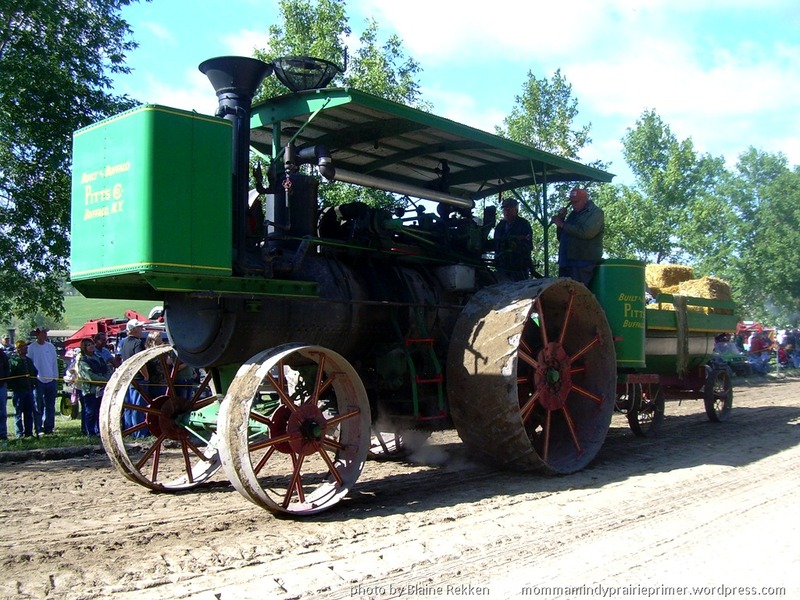 Every year they have a Steam Threshers Reunion in Rollag, MN where you can ride an old steam train, and watch old tractors and threshers in action and watch other pioneer demonstrations. It’s an annual Labor Day pilgrimage for many, including my cousin Blaine, who provided the great pictures. He also has that good Norwegian blood coursing through his veins. He works hard and keeps his house and yard clean, so I’m pretty sure Pa Ingalls wouldn’t mind having him for a neighbor. Wait, neighbour. The homesteaders were diligent to make history, these men and women are diligent in preserving history. Naughty, naughty Laura. After the threshers are gone, there’s a huge pile of golden straw. That’s the stuff left after you cut the grain off, in case ya’ don’t speak farmer. If you scroll back up to see the old picture and notice the straw stack in the background, you’ll know why Laura was enticed. 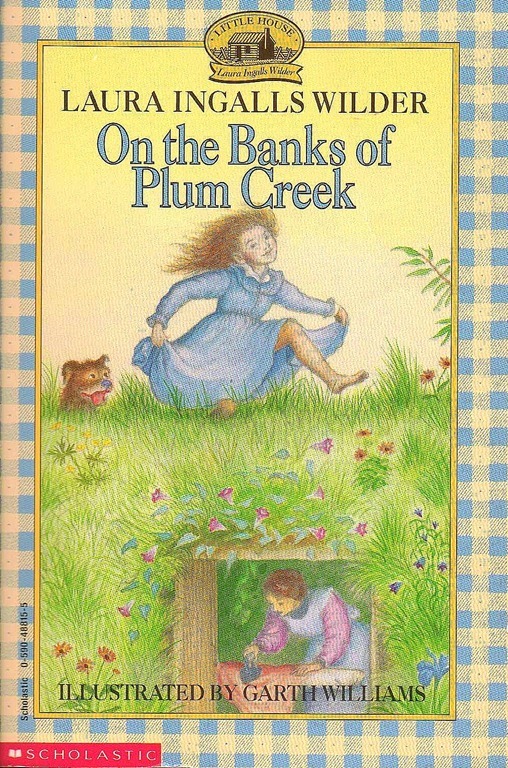 Laura and Mary go to that huge pile and slide down over and over until “there was hardly any stack left in the middle of loose heaps of straw.” (p. 53) Then Laura, like many sneaky kids I’ve known, went into the house and was very, very good. I learned too late in life, when a child is being exceptionally good, it’s probably bad. If they’re being very kind, helpful and waiting on you hand and foot, they might be atoning for sins you’ve yet to discover. Pa fixes the stack, like a good Pa, probably remembering his own childhood shenanigans. He sternly warns them to not slide down the hay stack again. She just goes to smell the straw. Pa didn’t tell her not to smell. Then, she climbs the straw. Pa didn’t tell her not to climb. She flies down the straw. She bounces down the straw. She rolls down the straw. She even convinces Mary to join in the fun. After all, Pa only forbid sliding down. I was expecting Laura to get a big ol’ fashioned spanking. She feared a spanking just for fidgeting on the Sabbath. But this time, she was really, really, really naughty. Instead of thrashing Laura and Mary for flattening what was left after threshing, Pa turns his back to the girls and quakes in the threshold. The girls were thankful to not be throttled, so were thoroughly through with their hay stack thrills. So, head out and get thrashing on your farming homework. What About Those Missing Years? Would YOU Remember Being Spit on by a Llama? Gone to My Happy Place, Be Back Soon!